Peer-to-Peer Fundraising is a great way to broaden your organization's reach and expand your donor base by utilizing the passionate supporters that you already have. Through peer-to-peer fundraising, your supporters can fundraise on behalf of your organization by creating a “mini-campaign” that champions for your cause. Peer-to-Peer fundraisers will have their own personal fundraising page tied to your fundraising campaign where they can set their own fundraising goal, share their personal story, and can easily manage their page on GiveGab so your best supporters can be your best fundraisers too! Who can I ask to be a peer-to-peer fundraiser? Anyone! Your most passionate supporters make the best fundraisers by sharing their connection to your cause with their network. Reach out to your board members, volunteers, staff members, and top supporters and join you in furthering your mission and bettering your community! Why should I use peer-to-peer fundraising? The main draw of peer-to-peer fundraising is that is can really expand your reach to a new network - we've found on GiveGab that on average, a peer-to-peer fundraiser brings in 4 new donors per campaign! Beyond that, peer-to-peer fundraising can increase the average number of donations you receive and it's a great way to engage with your supporters beyond asking them to donate. 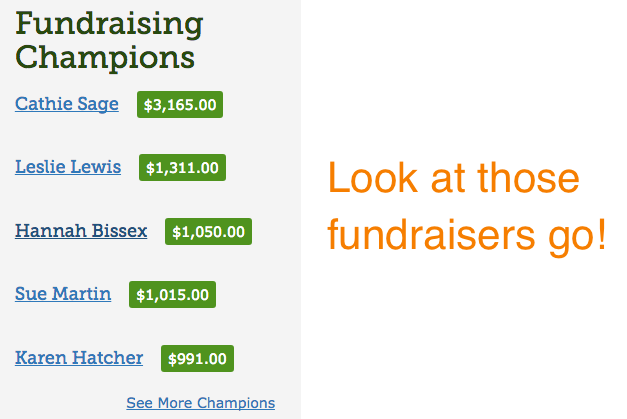 Your Fundraising Campaign has a built in Fundraiser Leaderboard, so use that to your fundraising advantage! You can invite your supporters to fundraise on your behalf - but before you do, make sure your fundraisers know you're sending them an invite. As soon as you invite those fundraisers, a fundraising page will be created for them, as well as login information. It's important that your fundraisers agree to become fundraisers before you officially invite them. Check Out These Peer-to-Peer Fundraising Blogs for More Info! Check out all the great resources your fundraisers will have in GiveGab's Fundraising Champion Toolkit!